﻿ October 2017: What’s New With Constant Contact? » Red Mango Marketing! 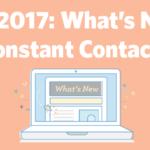 October 2017: What’s New With Constant Contact? Time to put away your swimsuit, take out your flannel shirts, and jump into the newest Constant Contact features. Want to learn the latest improvements and new features available in your Constant Contact account? Automation Emails: Constant Contact’s new autoresponder features let you easily add emails to your autoresponder series and as well as make copies of existing emails in the series. It’s time you put your email marketing on autopilot. Integration tab: The new integration tab gives you access to Constant Contact’s most popular integrations including our new Shopify app that helps you drive ecommerce sales. Marketing Calendar: The marketing calendar provides you with a monthly view of your emails, shows your relevant holidays, and lets you create and schedule emails right from this view. Donations Action Block: The new donation action block lets you easily make professional looking emails to raise awareness for a cause you’re raising funds for. Third-Generation Editor: Our latest and greatest third-generation editor now lets you quickly drag and drop images from your desktop into our editor, use a three column layout, and preview web content with the Read More action block. Note: Many of these features are only available in our third-generation editor. You can upgrade to the third-generation editor for free by contacting our Customer Support team. Stay updated on new product and feature improvements any time by visiting the Help Center in your Constant Contact account! Want to give these new tools a try? Not a Constant Contact customer? See what you’re missing! Sign up for a free 60-day trial. The post October 2017: What’s New With Constant Contact? appeared first on Constant Contact Blogs. This entry was posted on Friday, October 6th, 2017 at 12:21 pm	and is filed under Automation, Email Marketing, News & Updates. You can follow any responses to this entry through the RSS 2.0 feed. Both comments and pings are currently closed.